Are the Mets Interested in Chien-Ming Wang? Everybody Band Together to Cheer Against Brett Favre, Okay? The Yankees might not be signing Johnny Damon, but worry not: Come April you'll have forgotten all about him. 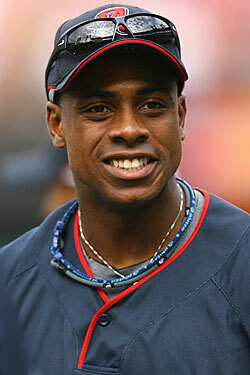 Curtis Granderson, your new center-fielder, seems to possess all the attributes we require of our Yankees: He's smart, funny, likable, and has exactly the kind of swing that pokes baseballs over a short right-field porch. (Bud Selig likes him, too, but don't hold that against him.) He sat down and talked with Richard Morgan about what he's expecting for his first season in the Bronx, his charitable organizations, and getting advice from Gary Sheffield. So what's happened so far? Who have you met? When the trade was announced, A-Rod immediately texted me, "you'll love it here." I met him and CC at the press conference with some front-office management. And I know Jeter from the World Baseball Classic. But that's it right now. What was it like to put on the pinstripes for the first time? You don't think about it when you play against them, you just see the "N.Y." But when you wear it, man, it's something. It pops. Have you gotten any advice on just what to expect? I was lucky enough to talk with Gary Sheffield, who was a Yankee and a Met and on seven total Major League teams. He told me all the things you'd expect: the media, the fan base, cops recognizing you, everyone remembering every slip-up you do. The media, yeah, I guess that's me? But I could see the Post or Daily News having a field day with your name. "GRAND MASTER." "GRAND SLAMMED." "DELUSIONS OF GRAND-EUR." I've heard it all. My charity is called Grand Kids. People keep thinking it's Grandkids. You don't get to keep No. 28. They offered it to me, but I knew Girardi wanted it for his quest for a 28th championship. He's the boss. Plus, I'm not going to mess with any of the superstition. There are so many numbers that are retired there, so there wasn't much choice. But No. 14 was available, and I was No. 14 in high school. So it worked out. What are you looking forward to in New York? Restaurants? Clubs? Dating? 4 a.m. last call? I love to eat. I'm not the biggest guy, but I love to eat. I love chains. You can never go wrong with a chain. In New York, there's the BLT steak place I go to with a grade-school buddy. But, really, I want seafood. You never hear about good seafood places. Baseball guys tend to flock towards steaks. So with all of these big personalities on the team, how are you going to leave your own mark? Look, Jeter and A-Rod — they're the guys carrying the team. There's no secret about that. I'm below the radar. I'm a chameleon. I'm not the loudest. I'm not a prankster. But I can be loud. I can pull a prank. I'm not the oldest. I'm not the youngest. I'm flexible. I adapt. [Laughs]. I won't prank you first, but if you prank me, then, yeah, I'll prank you back. Fair's fair. I won't wreck your car or bust the windows or anything. Nothing that's permanent damage, I promise you. But it'd be something to behold. All I know so far: not too far south and not too far east. So no Lower East Side for you? Yeah, I guess that doesn't sound like where I should be. Hopefully you're not in a hotel for too long. That'd be nice. At least it'd be clean all the time.